The film based on true events directed by Lee Tamahori is planned for Blu-ray in November. 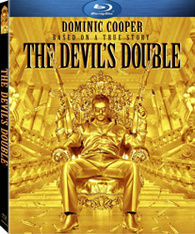 In an early announcement to retailers, Lionsgate says 'The Devil's Double' is coming to Blu-ray on November 22. Dominic Cooper stars as Iraqi Army lieutenant Latif Yahia who is ordered by his government to double as Uday "The Black Prince" Hussein -- the son of Saddam Hussein. Specs have yet to be revealed, but supplements include: Audio commentary with director Lee Tamahori;"Making of" featurette; Behind-the-scenes featurette on Dominic Cooper and his transformation into Latif and Uday; and an interview with the real Latif Yahia. You can find the latest specs for 'The Devil's Double' linked from our Blu-ray Release Schedule, where it's indexed under November 22.